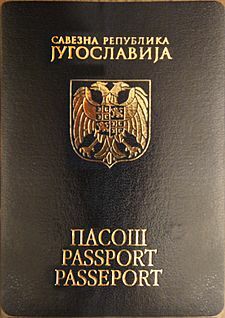 The Federal Republic of Yugoslavia (Serbian: Савезна Република Југославија / Savezna Republika Jugoslavija) or FRY was a federal state constructed by the republics of Serbia and Montenegro from the former Socialist Federal Republic of Yugoslavia (SFRY), created after the other four republics broke state from Yugoslavia amid rising ethnic attacks, war and tension. The state were exist from 1992 to 2003, when it was reconstituted as a State Union of Serbia and Montenegro which itself was existed three years later, when a referendum for independence in Montenegro resulted in the majority of Montenegrins supporting separation from Serbia. This resulted in both Montenegro and Serbia becoming different countries. Federal Republic of Yugoslavia Facts for Kids. Kiddle Encyclopedia.